About: Health Craze is a chain of health shops that specialise in a range of alternative therapies and products including skin care, herbs, homeopathic products, nutritional products and supplementary products. Try getting health advice from the professionals, but when they fail you, try here. Go with an open mind and expect to pay more for quality product and the advice. It took me 3 months but I'm glad I persisted. The owner of this store is the rudest woman I have ever come across, I have lived in the area for 7 years and will NEVER step foot in there again. Went in to enquire about a product and when I asked her the price of this specific product (which is a very normal thing to ask before buying anything that doesn’t have a price sticker on it) she started insulting us. She doesn’t seem to understand how to talk to human beings, I have no idea how she manages to run a shop and why on earth anyone would ever shop there. The chemist across the road and the one in the station are much much tidier, reasonably priced and neither have this woman working there which is definitely a bonus. Come here for in depth advice on supplements. Most people who review here miss the point about this shop. it has a lot of supplements,, vitamins, and other products you just cannot find in the other well known shops in the high street. I have tried both, and the cheaper generic supplements from the high street just did not work. 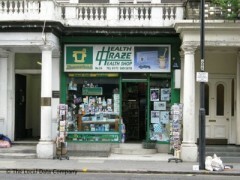 The specific advice from the lady who is in the shop was spot on and my health has improved. As for the rudeness, well, I can understand her frustration when so many people come in for a browse, start checking the prices on the internet and then expect her to match. As she said to me, she is not there for free advice, she has rates, rent, etc to pay, and i can't imagine having a shop in South Kensington being cheap. For me, I will still go out of my way to buy from this shop as the advice and product have helped me. I also have met a few regulars at the shop and they seem to be like me - happy customers. I hope the shop will be there for a long time. I came in here with a friend a couple of weeks ago and the saleslady has treated us with complete disrespect the entire time, by stating disconcerting and pointless comments about our character and making rude judgement calls without knowing us at all. Please, for the sake of your own well being, do not go here. A health food store, or any customer-service oriented space should not be dominated by such negativity. I've been coming to Health Craze for more than 5 years and have found the owner very helpful with regards to her products. Granted the shop is small; packed to the rafters But with a full range of products for most clientele needs. This is a one person operation so can be very busy through out the day. If the product isn't available she will try to obtain it for you. I have no complaints. I am happy to find that others have experienced the same abuse from an unnecessarily rude woman. On the particular instance in question, I went in this excuse for a shop (no floor space and random products scattered in strange places such as the floor), and asked if she sold liquid sweetener and was rudely answered with just a yes. The owner then pointed to a shelf completely obscured by other products, as if I was not allowed to see it almost. I obviously left...on the way out being yelled at as a time waster. I will not be wasting any more time in here! Surprised by the negative reviews which completely contradicts the service and care I've experienced. The owner is a pharmacist and has really helped my father who suffered with cancer. She goes beyond the call of duty - and gave me her email address for further advice. I wouldn't hesitate to recommend her to anyone. Shocking! It is messy, with unpleasant smell but by far the worst is the level of service - I was called a liar and accused of treating this woman as a slave just because I said I would double check with a friend what exactly she wants (product I was looking at comes in powder and capsules). She also told me that she doesn't want people like me in her shop. Suggestions for improvement: tidy up, calm down and work on people skills. I signed up to this website and wasted a tad bit of my time just to write this. The woman is crazy, rude, possibly a con. Do not ever start a conversation with her, she will explode. Look at how messy is the shop/pharmacy, you know something is wrong with the person. The owner of this store was rude and offensive to me for no real reason. All I was doing was looking at the goods on the shelf when suddenly she accused me of staring at her. After I denied staring at her and decided to leave the shop she followed me into the street and started shouting at me. I shall never go into this store again. WARNING! Do not buy anything from this woman!!! She cheats customers in many ways: adding drugs in the products, out of date stock, the products are ridiculously overpriced and her behaving is just awfull! All her medicines are fake! MEGA RUDE SERVICE FROM AN IGNORANT WOMAN. Me: "Hello, I'm calling to check if you have any oat bran in stock." her: (Big sigh) "Yes we do." (in an abrupt, irate tone). Me: "Is that the plain stuff?" Her: (Shouting) "I know what oat bran is! We sell tons of the stuff." Slams phone down. It's not so much what she said but the rude tone of voice and of course slamming the phone down. Needless to say it might just be a pack of out bran but I may have bought a whole heap of other stuff and I sure as hell won't be crossing the threshold of this unprofessional establishment. I am writing this as I called back to tell her how rude she'd been and no-one is answering the phone. So, nasty lady, here's your instant karma. The first and only review on the much used allinlondon site about the poor level of your customer service. I've since called Holland and Barrett and the sale assistant was more than helpful.